My reproduction 18th century stockings are sewn up and finished, this time in a lovely white cotton knit with embroidered clocks! These 1780's stockings are all hand sewn and hand embroidered. 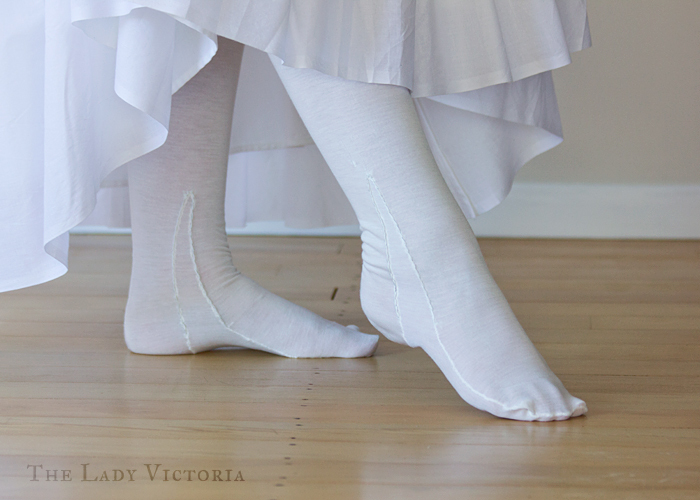 Although I already have a perfectly serviceable pair of late 18th century blue stockings, I really wanted a white pair to match the rest of my white 1780's undergarments. I didn't enjoy sewing the first pair, as I found the thin knit quite slippery and hard to work with. Happily, these ones came together a lot easier. After I bleached the blue cotton knit to white, I had enough fabric left over to make two white pairs. The fabric for the second pair is cut out and sitting in my stash, but I have no real reason to make them up any time soon. Stockings have been worn in some form for hundreds of years, and by the 1700's they had been refined into elegant, decorative accessories for men and women. Historically stockings are cut to fit the shape of the wearer's leg instead of being knitted in a long tube like today's versions. It's this technique that creates the long seam up the back of the leg - made famous in the nylon stockings of the mid 20th century. The invention of the knitting machine in the 16th century allowed for finer knitting, with wool, cotton and silk being the main fabrics. In 1561 Queen Elizabeth I was given her first pair of silk stockings, and the craze for delicate, decorative silk hose in bright colours took off. The early 18th saw stockings in bold colours being the norm- stockings in blue, green, pink and orange were all worn. These often had embroidery and decoration on the seams of the stockings that also helped to reinforce the stitching. In the later half of the 1700's stockings became a little less colourful, and white or ivory stockings remained de rigueur for the next hundred years or so. 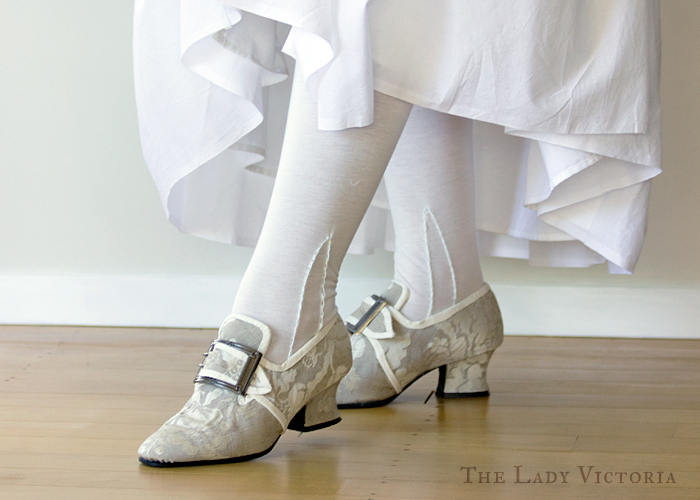 To stay true to the late 18th century, I wanted some simple white stockings with white embroidery. The embroidery floss I used wasn't quite white, but a slightly blueish white I picked up in a clearance sale. I quite like the subtle colour it adds, especially since the stockings are minimally decorated. Stockings worn by the upper and middle class were decorated with fine embroidery. The embroidery served two purposes: decoration and reinforcement. Historical stockings are cut in two pieces, with the main piece wrapping around the leg and the foot, while the bottom of the feet have a smaller, separate piece. The triangular seam joining these two pieces together is called the 'clock'. Embroidering over this helped to reinforce the stocking so the seams won't rip, and it also shows a little flash of colour and pattern at the ankle. Criss-cross or trellis patterns are seen a lot in surviving examples, as well as embroidered ribbons or flowers. Stripes at the top of the stockings also seemed to be common. 18th Century Notebook has a big list of surviving examples that show the type of decoration stockings usually had. 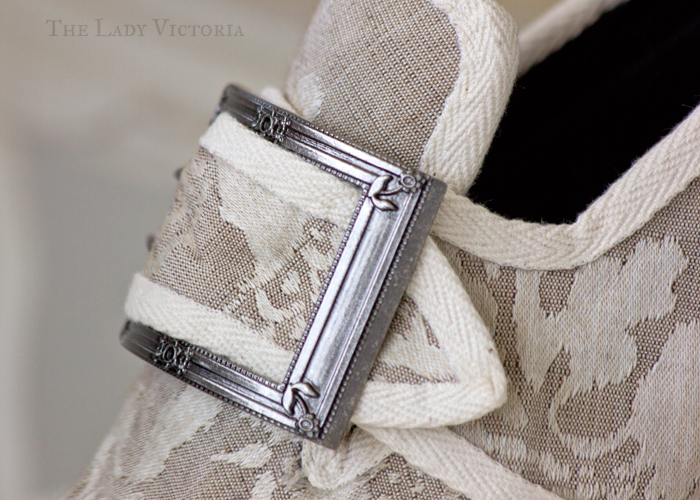 I did plan on doing a little monogram at the top of the clock, similar to my other pair. I tried but it just wasn't working - I couldn't find the balance between simplicity for ease of stitching and a good design. I did a monogram on one stocking but unpicked it...and managed to tear a hole in the fabric while I did. I patched it up with some white thread, and I don't think it's too noticeable. I definitely won't be making heavily embroidered stockings anytime in the future. My dislike of knit fabric and the complexities of embroidery make that project a hard pass from me. 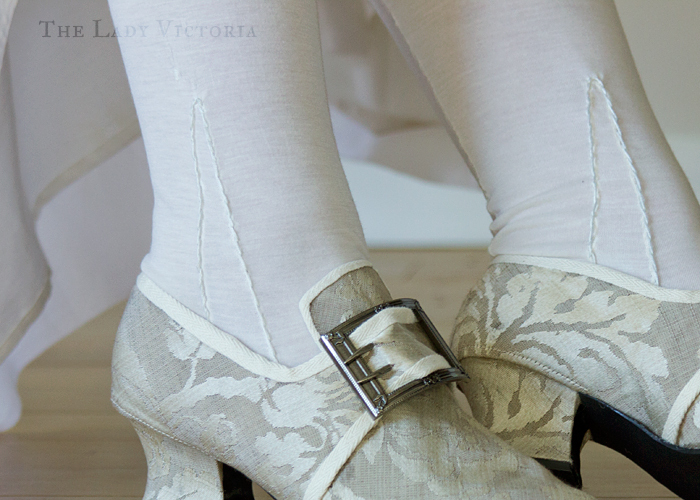 How Comfortable Are 18th Century Stockings? The cotton knit was much thinner than I remembered. The thickness and texture of the fabric might have changed since I bleached it, but I doubt it. The thinness and delicacy of the fabric is much more noticeable in this white pair than my other blue pair. I feel like you can see through them a lot more. If I ever need to make another pair I'd probably look out for a thicker knit. They could be good for winter to keep me warming, and a heavier fabric might be easier to embroider the clock on too. After wearing my blue stockings for a while I noticed that the tops of them sagged quite badly and would fall down my legs. This could be a fitting issue. I didn't make a mockup for the first pair of stockings and jumped straight into making them, but the top of the stockings do fit my thighs, they just don't stay there. 18th century stockings were always worn with garters secured below the knee to keep them up, but the top would fold down over them and flap around regardless. So for this pair I cheated a little and added some elastic to the top. It keeps them up perfectly and I have the garters there for extra security, and to keep things taught and smooth over the lower legs. These stockings are very comfortable, and I improved a lot on my blue ones. You might be able to see that the toe area doesn't fit quite as well on these ones. Usually I'd try them on, see where my toes end up and cut diagonally across from my big toe to my little toe to form the toe seam. For this pair was lazy - I guessed and just cut straight across as I was sewing them. Although modern socks and stockings have a straight or slightly rounded toe seam, the amount of stretching they do means the toe area fits most people regardless. 18th century stockings are much more tailored, and rely on a precise fit to the wearers leg with not much stretch. This means they're very comfortable and fit better than modern socks, but any missteps are more pronounced without the extremely stretchy fabric to smooth everything over. Always measure and cut your toe seam properly! Although plainer then I'd have liked, I'm very happy with these stockings. They fit better than my last attempt, they're pretty, and they match the rest of my 1780's clothes and shoes much better. Although they were all hand sewn, they didn't take too long to do. 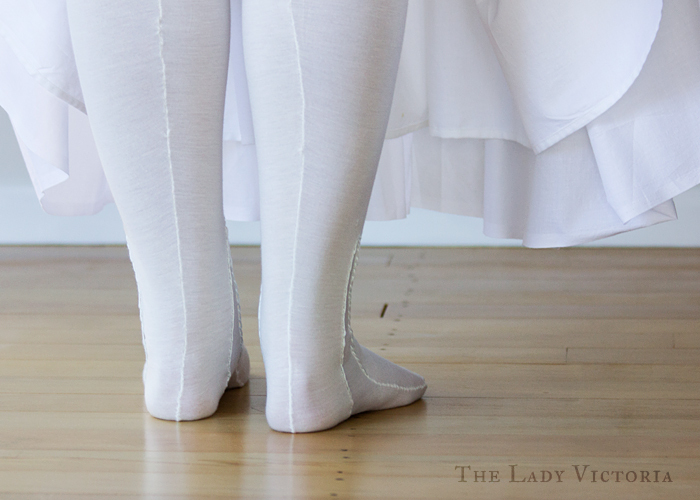 If you want to make your own pair of late 18th century stockings I have a guide which details the fabric I used, the pattern I made and how I pieced them together.